When it comes to fruits and veggies, generally the brighter the color, the more nutritious. However, white mushrooms break the rules, and these relatively dull and colorless veggies come packed with nutrition. Their meaty texture helps add body to your meals, but their low calorie content of 21 calories per cup, means they won't expand your waistline. Incorporate white mushrooms into your cooking and enjoy several benefits associated with their nutrient content. White mushrooms benefit your bones by boosting your copper and phosphorus intakes. These minerals have distinct roles in skeletal health; phosphorus contributes to the inorganic mineral tissue that provides bone density, while copper helps you make collagen, a protein that keeps your bones from becoming brittle. Both minerals also aid in energy production, and phosphorus helps you make DNA. A cup of whole white mushrooms provides 305 micrograms of copper, or 34 percent of the recommended daily intake, as well as 80 milligrams of phosphorus, or 11 percent of your daily intake requirement. 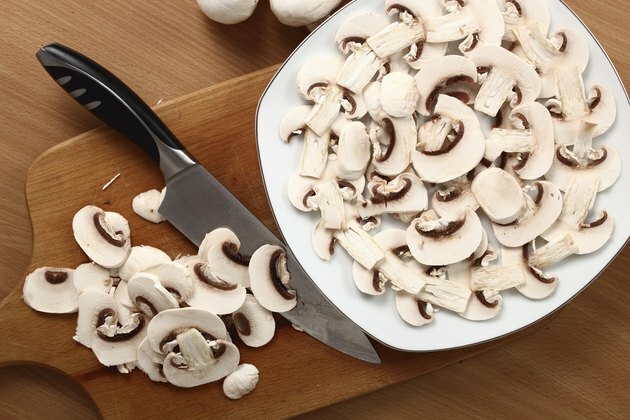 Add white mushrooms to your diet and you'll also consume more B-complex vitamins, particularly B-2 and B-5. Both nutrients help activate enzymes that your cells need to convert into energy. Vitamin B-2 also supports liver function, while vitamin B-5 aids in the production of hormones. A cup of white mushrooms contains 1.4 milligrams of vitamin B-5, which is 28 percent of the recommended daily intake. Each serving also boasts 0.37 milligram of vitamin B-2 -- 34 and 28 percent of the recommended daily intakes for women and men, respectively. White mushrooms also house a range of beneficial antioxidants. Chemicals with antioxidant function fight oxidation -- a chemical process that increases your risk of genetic mutations, and also damages the lipids and proteins that make up your cell membranes. White mushrooms contain ergosterols, one type of beneficial antioxidant, according to a study published in the "Journal of Agricultural and Food Chemistry" in 2010. The mushrooms might also play a role in fighting chronic disease. One animal study, published in the January 2010 issue of "Nutrition Research," notes that white mushrooms helped lower cholesterol levels and blood sugar. This suggests that white mushrooms might offer benefits for controlling high cholesterol or diabetes, though more research is needed to figure out how well they work. Use white mushrooms' meaty texture to your advantage in the kitchen. Use sauteed mushrooms in place of some of the ground beef in homemade meat sauce for pasta, because you'll lower the sauce's calorie and fat content. Combine sauteed white mushrooms and onions, breadcrumbs and lentils in a food processor for meaty vegetarian burgers, or use seasoned cooked white mushroom slices in place of meat in fajitas or tacos. Alternatively, simply drizzle white mushrooms in olive oil, wrap them in tinfoil and then barbecue until tender.